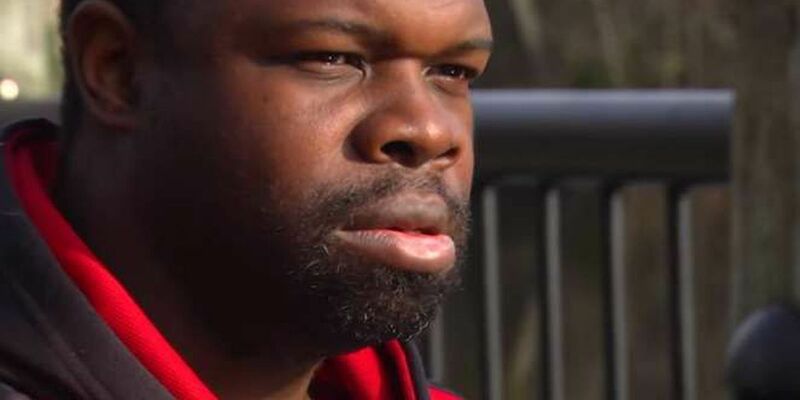 CONWAY, SC (WMBF) - It's a tale of alleged torture: a mentally-challenged man says he was physically abused by his employer for years. "He would beat me with belts and all that," says 37-year-old John Christopher Smith. "Take the tongs to the grease on my neck." Smith explained what happened while looking out over the Waccamaw River, alongside one of his advocates. "I want him to go to prison, and I want to be there when he go," Smith said. He has been diagnosed with mild delayed cognitive development, a condition that results in intellectual functioning significantly below average. He says he had been working at J&J Cafeteria in downtown Conway since he was 12 years old, busing tables, cooking and doing all sorts of tasks. "I started off washing dishes after school," he said. It was a job Smith says he liked, until the manager, 50-year-old Bobby Paul Edwards, the brother of the owner of the restaurant, allegedly started physically abusing him back in 2010. Court documents describe awful things like beatings with a belt, choking, slapping, and even an incident where Smith was punched with a closed fist. He says he never said anything because he was scared. Smith said he got the scars on his back from the time he was allegedly burned by Edwards with hot tongs. The doctor's assessment from the Conway Physicians Group in Aynor done October 20, 2014 confirms the scars. "It's total abuse," said Geneane Caines, Smith's advocate. Caines says she got involved because she cares, and she's familiar with the case. Her daughter in law is a waitress at the restaurant. We asked her how this could have allegedly been going on for four years. "Well, costumers that were going in there would hear stuff and they didn't know what was going on, and they would ask the waitresses, and the waitresses were so scared of Bobby they wouldn't tell them then what it was," she said. Caines, however, reported the abuse to authorities and took Smith to the Conway NAACP meeting in October for help. She says she also contacted the Department of Social Services. A Conway police report shows on October 10 of 2014, Conway police assisted the agency in removing Smith from the property. It says he was taken to an undisclosed location for his safety. A little more than a month later, Edwards was arrested and charged with 2nd degree assault, a misdemeanor. "Anyone who is rational and has any sense of logic should realize once you have the facts right here, it should be more than just assault," said Abdullah Mustafa, the president of the Conway chapter of the NAACP, who is outraged. Mustafa believes SLED, the agency investigating the case, is being too lenient with just a 2nd degree charge. He says the NAACP plans on filing complaints with the Department of Justice and the Department of Labor. "We are talking about enslavement here," Mustafa said. Right now, the accused is out on a $10,000 surety bond with special conditions that he is not to go near the Smith, and must get permission to leave the state. Edwards said over the phone that he declined to comment on the case. SLED says until the case over, they also won't comment either. Meanwhile, the owner of J&J Cafeteria, Ernest Edwards, spoke with us in length about the situation. Edwards says he knew nothing about the alleged abuse because he wasn't around a lot; he spent much of his time at the two other restaurants he owns in Myrtle Beach. It's been a little more than four months since Smith left the restaurant, and according to Caines, he's doing much better. "He's a total different person now; he holds his head up high, he's very happy, very outgoing, he don't even act the same," said Caines. The next hearing in the criminal case is March 13, 2015 at 8:30 a.m.